I've read a lot of books that left me thinking "Wow! I should read the sequel sometime soon!" and then I get to the next book within another year. 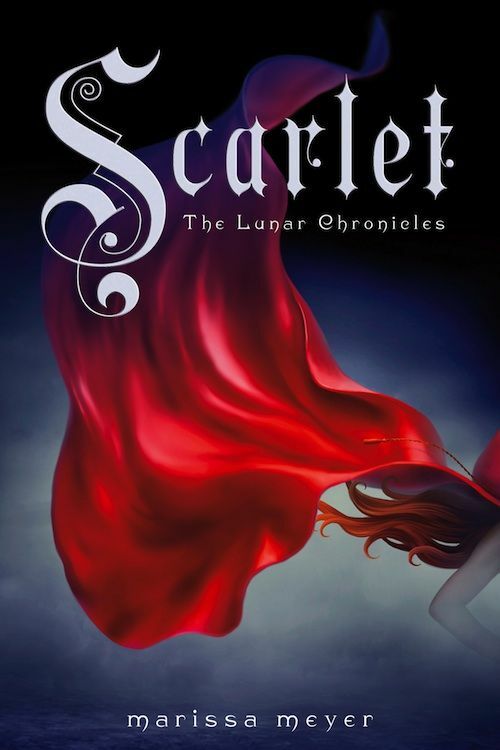 Cinder, the first novel of Marissa Meyer's Lunar Chronicles series, left a stronger impression: I needed Scarlet about as much as we need oxygen to breathe. In this installment, Meyer puts a spin on the old tale of Little Red Riding Hood, and hence, we are introduced to Scarlet. Scarlet's grandmother has been missing for a couple of weeks now, but no progress has been made in the search. So, Scarlet decides to go looking for her herself, and as it turns out, things are much more complicated than she would've ever anticipated. She encounters a dangerous-looking street fighter named Wolf, who could be her best protector or her worst enemy on this quest, and her grandmother's secrets could be utterly groundbreaking. But can Scarlet save her in time? Meanwhile, what will Cinder do next after that awful cliffhanger in the first book of the Lunar Chronicles, and how are these two teenage girls connected? Isolated aspects of this book are fabulous: The plot, the characters, the contrasts and relationships, the action... But blended together, it's so good that it's almost too much to bear. I CANNOT STOP FANGIRLING. Scarlet was an amazing book! As one could tell from a description, the story isn't just about Cinder and Kai anymore; Marissa Meyer has added quite a few new characters and concepts to the story. As much as I love Cinder and Kai as characters, I can't complain about the newcomers taking up any facetime because I adore them just as much. Scarlet is so strong, and even though the poor girl's going through so much, she handles everything with bravery. And oh my goodness, then there's Wolf... I LOVE HIM. He's a flawed character (even though there's not much he can do about it to a degree) and his background is so interesting to me; I've never read about anyone in his situation before. He's definitely my new favorite fictional love interest. I can't wait to see more of his relationship with Scarlet as well as more of his affectionate side. But I must say, I'm also excited for more of Thorne! Another awesome new character! This guy is hilarious; I was laughing out loud when reading his dialogue, and he clashes with Cinder's personality so much. Thorne's self-centered and materialistic attitude, Cinder's sarcasm... I think they're a great unlikely team. Even though these characters would be interesting enough sitting in a cardboard box, all the action adds to the excitement - and trust me, there's plenty. The fight scenes are intense and well-executed, and overall, I just couldn't put this book down. It's urgent, it's entertaining... It's basically flawless. There are some more dark moments in Scarlet too. Granted, anyone who's read Cinder will know that the character Queen Levana is evil, but after reading this sequel, the fact feels as though it's been enforced even more. She is horrible and ruthless. I really just want to babble about this book forever, to be honest. It's a perfect blend of elements, and Marissa Meyer polishes each element as though each one would have to stand out on its own. I don't even care for fairytale retellings in general, but this is just epic. Cinder was a truly outstanding book, and Scarlet is just as amazing. One of my favorite books; one of my favorite series... Scarlet has made me so happy, and I'm sure the third installment, Cress, won't disappoint.